Author’s note: The following article was mostly written before Donald Trump became president-elect. His electoral victory if anything strengthens the thesis presented that imperialist governments, led by the U.S., will soon shift from a focus on monetary policy toward greater use of “fiscal stimulus” (government deficit spending) to extend the “recovery” from the overproduction crisis of 2007-2009 and attempt to reverse the decline of the U.S. empire. However “unconventional” the policies a Trump administration may introduce, the objective laws governing the capitalist economy uncovered by Karl Marx will prevail in the end. Marxist economists often use the terms overproduction and overproduction crisis. But what exactly is overproduction? What is being overproduced, and in relation to what? Why does overproduction inevitably lead to a crisis and contraction of the capitalist economy? How do overproduction crises re-balance and stabilize the economy—a prerequisite for renewed growth of production? A common conception of overproduction is based on Marx’s theory of surplus value, in turn based on the labor theory of value. Productive (of surplus value) workers receive in wages and benefits only a fraction of the value they create in the course of the work day. In effect, they work for themselves for part of the day in return for wages (paid labor) and for the capitalist the rest of the day free of charge (unpaid labor). Believers in underconsumptionism sometimes explain the fact that the capitalist economy is subject to periodic crises (usually every 7-11 years) this way: Demand in the economy fluctuates based on expanding and contracting credit and rising and falling interest rates, at least partly controlled by the central bank—in the United States the Federal Reserve System. When workers take on debt, it expands demand for cars and housing and enables other major purchases. This expansion of credit temporarily overcomes the “underconsumptionism” inherent in capitalism, allowing the economy to expand. 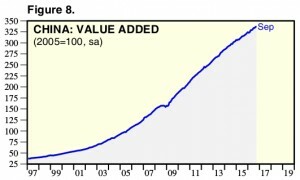 When, however, wages rise “excessively,” allegedly causing inflation (according to pro-capitalist economists), the Fed is called upon, as is sometimes said, to “take away the punch bowl before the party gets out of hand.” Credit is tightened, interest rates shoot up and a “credit crunch” ensues. Millions of workers are laid off, and the economy plunges into recession. The crisis itself causes interest rates eventually to fall and forces many businesses and individuals into bankruptcy, wiping out substantial amounts of debt. The basis is thereby laid for economic recovery, a renewed expansion of credit (and debt), and a new upturn in the cycle. A major flaw in this underconsumptionist explanation of overproduction crises is the notion that it is only, or mainly, workers who contribute to aggregate demand. However, capitalists as well as their unproductive (of surplus value) hangers on—not least the government and its dependents—also contribute, and not in a small way. When the capitalists (corporations are collective capitalists) realize in money the surplus value contained in the commodities produced by their workers, they allocate part of it (in the form of dividends, interest, rent, bonuses and the like) to their own lavish consumption, adding to demand. 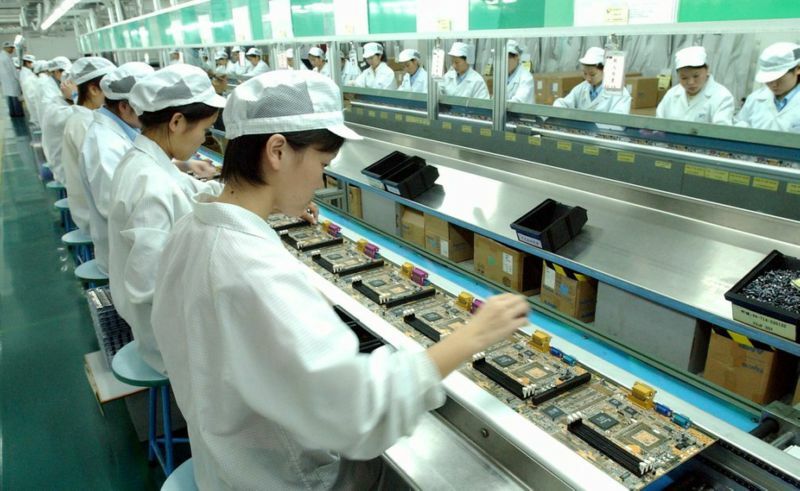 The larger part of realized surplus value, however, is re-invested productively through the purchase of machinery, raw and auxiliary materials (such as energy), and labor power (hiring more workers) to further expand production. Such productive new investment also contributes to aggregate demand, effectively demolishing the simple underconsumptionist explanation outlined above. Rosa Luxemburg (1871-1919), the famous German revolutionary Marxist, put forward a more sophisticated underconsumptionist theory, which in addition to explaining economic downturns sought to explain the rise of monopoly capitalism/imperialism in the last third of the 19th century. She also argued that inherent in a pure capitalist economy is a deficit of demand for all the commodities produced. Only the existence and purchasing power of pre-capitalist economies in the world, she said, could make up this deficit. This in turn explained, she argued, the mad scramble of the leading capitalist powers in preceding years to conquer, colonize and divide up the globe. The famous British bourgeois economist John Maynard Keynes (1883-1946) was also something of an underconsumptionist, though not on the basis of the Marxist theory of value and surplus value, which he neither accepted nor understood. of workers and machines. In response to the Great Depression of the 1930s, which in reality disproved this “theory,” Keynes gave it a face lift to account for the reality of mass unemployment. Without going into detail (available in this series of Critique of Crisis Theory posts), Keynes claimed that it was possible for the capitalist economy in circumstances he termed a “liquidity trap” (excessive “saving” and insufficient spending) to reach an equilibrium characterized by mass unemployment and great excess industrial capacity. Based on this theory, which later gave rise to what is now called “macroeconomics,” Keynes and his followers called for government deficit spending to escape the liquidity trap and make up for the deficit in aggregate demand. The claim was that with the right mix of (central bank) monetary and (government) fiscal policies, serious economic crises would be a thing of the past. As subsequent history was to show, however, capitalist economic crises continued to strike and even tended to get worse. To understand why, we have to go back to Marx’s labor theory of value and apply it to production, overproduction and the role of money in the capitalist economy. In simplest terms, overproduction is a rise of production of commodities relative to the market for those commodities. In other words, it is production of commodities in excess of what can be sold at a profit. This is an inherent feature of the capitalist economy, both in its competitive and its monopoly phase. But why is that, and is there a solution short of abolishing capitalism? Clearly, if the problem is insufficient wages of workers, then a general rise in wages should be sufficient to overcome the problem. Or if that won’t work (because higher wages lower profits and discourage production), increased government spending should do the trick. This was the solution put forward by Keynes and now by neo-Keynesians and post-Keynesians. But exactly this solution was tried in the 1970s and led to stagflation (economic stagnation and soaring inflation), followed by the vicious crisis of 1980-1983. Now, after austerity and “quantitative easing” have failed to surmount economic stagnation and continued depression in the U.S. and EU, the Keynesian prescription is gaining support once again. In reality, there is no solution within capitalism. To understand why, we must clarify what is production and overproduction from a scientific standpoint. Production within capitalism is production of commodities, which possess both use values (utility) and value (being a product of abstract human labor, labor in general). Gold could not serve as money if it was not a commodity and subject to the law of labor value just as other commodities are. As explained in a previous article, this remains the case today, despite the fact that the U.S. dollar and other “fiat” currencies are no longer on any form of gold standard and so no longer have a legally fixed parity to gold but “float” in gold value day to day. Economists have long observed that market factors can and do cause prices of individual commodities to rise above or fall below their underlying values, or “natural prices.” In the longer run, however, countervailing tendencies exert themselves and prices “revert to the mean.” The end result is that market prices fluctuate above and below values (or rather “direct prices” corresponding to values) as competing capitalists seek the maximum profit—a key way in which the “invisible hand” of Adam Smith regulates production of commodities and distribution of labor in roughly the correct proportions. Otherwise, economic chaos and anarchy would prevail and capitalism would be impossible. Less commonly understood is that something similar occurs on the level of the economy as a whole, involving the prices of all non-monetary commodities relative to the sum total of their values. The sum total of these prices can and do also rise and fall above and below their values. And here is the key to understanding not only the inevitability but actual necessity of capitalist crises of overproduction to regulate capitalist production—that is, keep production roughly within the bounds of the market. But what determines the market and why does it inevitably lag behind the tremendous productive capabilities of capitalism? The answer is that monetarily effective demand in a capitalist economy is over the long run determined by the rate of growth of the global supply of money—that is, the global supply (both official and private holdings) of the money commodity gold. (For further details on this critical point, see previous article.) Ultimately, a crisis of generalized overproduction results from the overproduction of all—or at least most—commodities relative to the special commodity that serves as money. What I want to do now is focus more precisely on what overproduction is based on the law of labor value. First, how do we know when general overproduction of commodities has begun? There are several typical signs: Prices (in terms of gold) rise and soon begin on average to exceed their underlying labor values (direct prices); as prices rise, demand for money and credit grows and interest rates, which balance the supply and demand for money and credit, begin to rise above their longer-term averages, reflecting a growing shortage of loan money capital relative to productive capital (such as machines and the purchased labor power of workers); credit begins to expand rapidly, enabling overproduction in relation to the market to continue; and the “animal spirits” of capitalists and speculators are stirred up, leading to greater risk-taking in investments and outright gambling and even swindling in the financial markets. The rise of prices (in terms of gold) cause the profitability of gold mining and refining to fall, since the costs of these industrial capitalists now also rise. Gold production then rises more slowly or actually begins to fall, thereby slowing the growth of the global supply of the money commodity. Overproduction can go on for some time with the further extension of credit by the banks and other lenders to both capitalists and consumers—leading into the “boom” phase of the industrial cycle. Inevitably, since the rate of growth of the global money supply lags more and more behind the rising production of non-monetary commodities, at some point interest rates rise to a point where what Marx termed the “profit of enterprise” (total profit minus interest) is wiped out and the basic motive for capitalist production is destroyed. 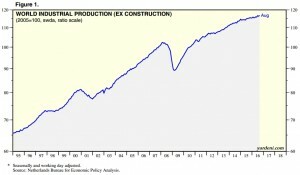 This chart clearly shows the crisis-depression phase of 2001-2003 and the much deeper one of 2008-2010. 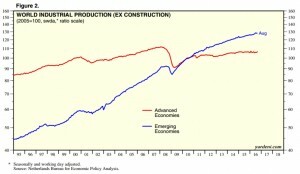 The chart indicates that the global economy entered into what Marx termed the “average prosperity” phase of the industrial cycle in 2011, when industrial production exceeded the previous peak reached in 2008. 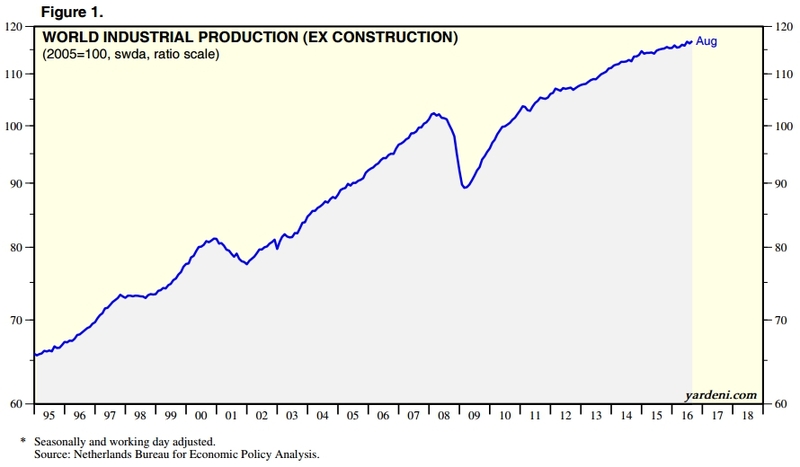 Global industrial production has continued to rise up to the present, though at a slower rate in the past two years. The next chart breaks down global industrial production by “advanced” versus “emerging” economies. This revealing chart shows clearly that the advanced (mostly imperialist) countries have still not fully recovered from the 2008 crisis, and remain mired in the depression phase of the industrial cycle with production flat, at best, over the past several years. The emerging (mostly oppressed) countries, in contrast, had fully recovered by 2010 and continue to show a steady, though somewhat slowing, rise in industrial production. Beginning in 2010, these economies as a whole entered what Marx called the “average prosperity” phase of the industrial cycle. Undoubtedly, a factor behind these contrasting trends has been the austerity policies implemented by virtually all the governments of the “advanced” countries following the massive bailouts of their biggest banks to stave off what otherwise would likely have been a complete collapse of the entire banking system. They had to implement such policies in a desperate attempt to reduce the huge debt load taken on by most of these governments—for the most part, it was not politically possible to raise taxes to finance the bailouts—leading to what became known as “the sovereign debt crisis,” which hit several European countries like Greece especially hard. A longer-term, more fundamental factor was the wave of national liberation struggles coming out of World War II . The U.S. attempted, with some success, to divert each of these struggles for independence from the old colonial empires into a neo-colonial relationship with the new global hegemon, with subservient client regimes in power. However, beginning with the great Chinese Revolution of 1949, and subsequently the heroic and victorious struggle of the Vietnamese people, both having benefited from substantial material aid plus military protection from the then-existing, nuclear-armed Soviet Union, the previous industrial monopoly enjoyed by the imperialist countries was progressively undermined. The economic development of China and Vietnam, and growing numbers of other “emerging” countries as a result of their own liberation struggles, then took off as sharpening competition forced imperialist monopoly corporations to export more and more of their realized surplus value in the form of capital (and jobs) to these countries. Neo-liberal “free-trade” policies and agreements were implemented to facilitate the process. Though highly profitable for the imperialist monopolies, since wages and therefore labor costs were far lower and regulation far less in the emerging countries, the end result was progressive undermining of industry in the “advanced” economies—now termed “de-industrialization.” The imperialists soon began to realize that the entire basis for their political, social and economic stability was coming undone. The demise of the Soviet Union and East European socialist governments in 1989-1991 came at an opportune time for U.S. imperialism to attempt to reverse these trends. A series of ‘unending’ wars against independent or semi-independent governments began with Yugoslavia and then extended to other developing countries including Iraq, Libya and now Syria—aimed at dismembering them and destroying any possibility of independent economic development. China and Russia as well as Iran, Brazil and Venezuela, and now apparently even Turkey, are on the target list for ‘regime change’ and dismemberment. These trends demonstrate the progressive character of the national liberation struggles, even if, as in most cases, they ended up developing their economies on a capitalist basis. The trends also demonstrate the reactionary character of all the bloody, costly efforts by U.S. imperialism and its satellite imperialist allies to roll back these struggles and destroy any victories achieved. 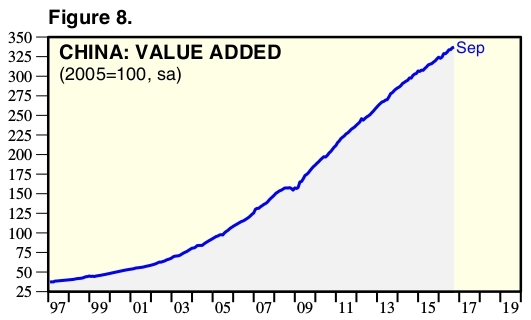 The following chart illustrates the dramatic rise of industrial production in China going back to 1997. The rise has been steady and strong with the only pause in the upward movement occurring during the global Great Recession of 2007-2009. But even that was more a leveling off than a sharp contraction such as occurred in virtually all other countries. For comparison, according to the Federal Reserve, during the 1920s U.S. industrial production rose by about 38 percent, though from the bottom of the sharp wartime-to-peacetime conversion crisis of 1920-1921, the increase was close to 100 percent. The comparison is relevant because the U.S. in this period played a similar role in the world economy as China has been playing in recent years. Had the U.S. economy not been operating at close to capacity at the beginning of the 1920s owing to the demands of WWI, and had there been huge reserves of labor power in the U.S. comparable to the enormous peasant population that China could still draw on 10 years ago, and a similar amount of incoming foreign investment as China enjoyed as a result of its “opening up,” it is likely the U.S. expansion in the 1920s would have been similar to what China has experienced in the past decade. It should also be noted that a mid-decade pause occurred during the “Roaring Twenties” in the U.S. similar to the 2007-2009 pause shown in the above chart that occurred in China. That pause would likely have been an actual sharp, if brief, contraction if the Communist Party-led government had not resorted to drastic Keynesian-type deficit spending on major infrastructure projects. The CCP-led government mobilized major banks and other large state-owned enterprises to support the effort. No such policies were necessary in the U.S. to avoid a sharp mid-1920s downturn. In sharp contrast to the chart of industrial production for rising China, the following chart shows industrial production over the same period for the leading imperialist power—the United States. The U.S. empire, though still immensely powerful, is in decline, just as the once immensely powerful British Empire had gone into irreversible decline by the 1920s. As previously explained, this trend is at least partly explained by the austerity policies implemented by governments in virtually all these countries, necessitated by their earlier bank bailouts, though the impact has been somewhat less severe in the U.S. than in the EU countries. These policies have mainly impacted social programs benefiting the working class, but military spending as been affected as well, though to a lesser extent. The hope of the policymakers is that these policies have improved the financial position of the governments sufficiently to enable shifting from depending mainly on monetary policy (“quantitative easing”) to force down interest rates and combat growing downside economic risks to relying more on “fiscal stimulus” (government deficit spending). The U.S. Federal Reserve began “tapering”—that is, leveling out and then cutting back—its unprecedented quantitative easing program in September 2014. The Fed has made clear that it intends to continue on the path to “normalizing” monetary policy going forward. The hopes of the policymakers of indefinitely staving off another overproduction crisis will not be fulfilled. To understand why another crisis in the relatively near future—probably within the first term of President Trump—is inevitable, we need to determine not only where we are in the 7-11 year industrial cycle but also where we are in the long price cycle of the global capitalist economy, known as the Kondratieff cycle, which reflects longer-term trends in the economy. My previous articles, “Signs of a renewed general crisis of capitalism” and “Further data on the role of the money commodity,” explain the basis for the long price cycle in the swings of profitability of mining and refining the money commodity gold versus the general profitability of producing other (non-monetary) commodities. These articles also point out the correlation that has existed historically between sustained increases in gold production, along with cheapening of the money commodity in value terms, and relative capitalist prosperity. I will not repeat these explanations here but will examine in more detail the most recent trends in the longer- and shorter-term cycles, both of which are fundamentally determined by underlying, objective laws governing the economy, and only secondarily by government policy and who occupies the White House—even a Donald Trump. In writing the above-mentioned articles, my assumption was that the dominant faction of the U.S. capitalist class did not want Donald Trump to win the presidency and would pull out all the stops to prevent him winning. That assumption proved to be true, though it turned out they didn’t get their way. Finance capital’s preferred candidate, Hillary Clinton, was so widely hated by great swathes of the electorate fed up with the status quo with which she is identified, even the abhorrent Trump, with his racist, misogynist, pseudo-populist demagogy, was able to prevail—if not in the popular vote, in the electoral college. The first of the above-mentioned earlier articles includes a chart showing U.S. producer prices in gold terms going back to January 1913, which illustrates the long price cycle up to January 2015. Below is an updated chart showing U.S. producer prices in gold terms going back to January 1980 up through Sept. 30, 2016. As this chart indicates, U.S. producer prices in gold terms have fallen rather sharply in the past year, though they have not yet dropped below the previous low reached in 2011. In any case, this confirms that the global economy has been weakening. As I suggested in my previous articles, it is likely that another serious overproduction crisis will need to occur, possibly a super-crisis on the scale of 1930-1933 or worse, to lay the basis for a sustained long-term upturn in real prices comparable even to the period of the “Great Moderation” from the mid-1980s to 2001. Such a crisis would drive real prices (in terms of gold) down past the 2011 low point to a level where the profitability of gold mining and refining (due to greatly reduced costs of production) would exceed the general profitability of producing other (non-monetary) commodities. The result would be for capital—always seeking maximum profits—to flow out of non-monetary commodity production into greatly expanding the production of the money commodity gold. Sooner or later, barring a socialist revolution, runaway climate disaster or a nuclear holocaust, this would lay the basis for a new sustained period of rising real prices and relative capitalist prosperity on a global basis. It is interesting to observe that the period of the Great Moderation is generally said to have extended to 2007-2008. But real prices, as shown in the producer price chart above, peaked in 2001 and then began a sustained decline. The initial drop in real prices resulted from the recession-depression of 2001-2004. But between 2004 and the beginning of the Great Recession, the monetary authorities and capitalist governments attempted to defeat the continuing deflationary trend in real prices by depreciating the U.S. dollar and other major currencies against gold to keep nominal prices stable or rising. The dollar price of gold soared during this period, reflecting that depreciation, which then forced the Federal Reserve to raise its policy (federal funds) interest rate sharply to avoid a run on the dollar and its collapse, along with the collapse of the U.S. empire that would surely follow. The Fed’s shift in monetary policy is illustrated in the following chart. Beginning after the recession-depression of 2001-2004 had run its course, the Federal Reserve kept its policy interest rate (red line) below the market-based three-month Treasury Bill rate (blue line), until mid-2005, when it was forced by the soaring dollar price of gold (reflecting depreciation of the dollar) to push the fed funds rate slightly above and then, by mid-2006, substantially above the rising market-based short-term interest rate. The soaring interest rates, partly caused by Federal Reserve tightening but more fundamentally by the industrial cycle entering its boom phase, soon caused the housing bubble to burst precipitating the Great Recession. 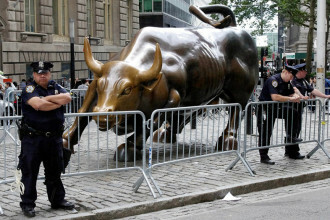 I should note here that the Great Recession, an overproduction crisis, was not primarily caused by the criminal behavior of bankers, hedge funds and other big speculators in the financial and real-estate markets—in short, by “Wall Street” or “greedy bankers”—as commonly claimed by commentators on both the populist/progressive left and on the proto-fascist, pseudo-populist, white-nationalist right. For those on the far right, these are code words whose meaning goes back to the anti-Semitic propaganda of the 1930s, which blamed all the problems of the Depression on an “international Jewish bankers’ conspiracy.” Marxists should avoid such formulations because they are incorrect—though the big banks certainly play an important role in extending the period of overproduction through “overlending” (lending too much). The end of overlending by the banks and other creditors then precipitates the crisis, making it appear that the banks and not the capitalist system as a whole is the cause of the crisis. This illusion feeds reactionary prejudice and scapegoating and plays into the hands of the neo-fascist forces now on the rise. Is more than a short-term upturn possible? 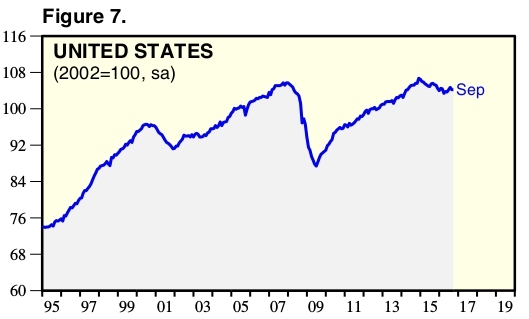 As shown on the above producer price chart, it appears that once again we have entered a period of falling real prices, which correspond to the decline in U.S. industrial production over the past year. Oil prices were hit especially hard, dropping from around $105 per barrel in mid-2014 to a low of about $30 per barrel early this year, then rebounding to around $45 per barrel recently. The question now is, can increased fiscal stimulus (easing of some austerity measures, additional spending on infrastructure such as president-elect Trump has called for, and more war spending) combined with continued “normalization” of monetary policy, all now being actively considered by policymakers, bring about more than a short-term rise in industrial production and real prices? Quite likely it will not, this side of a new overproduction crisis, which is coming due. At best, we can expect a rise lasting a few months or possibly a bit longer, followed by a new crash. Interest rates, both short-term and long-term, have been rising since late June, and since Trump’s election have been rising dramatically. Any attempt to combine a tighter monetary policy with fiscal stimulus means a rapid rise in interest rates. Any substantial rise in industrial production will push rates up even faster. Experience shows that rapidly rising interest rates quickly end in recession. Much depends on what happens with real prices in the coming period. If they continue or resume their fall as they did in the mid-2000s, the Federal Reserve will be forced to depreciate the dollar once again to fight deflation. The deflationary “mini” recession (relatively small contraction in industrial production) that began after the Federal Reserve started its “tapering” in 2014 bought some time but probably not much. Allowing the dollar to depreciate is extremely risky, since a run on the currency such as the one that occurred in 1979-1980, only stopped thanks to extreme tightening of credit by the Federal Reserve, could easily get out of hand. On the other hand, it could be argued that we have seen the bottom of the long price cycle, and just like in the mid-1980s are about to embark on another Great Moderation-like period of rising real prices and relative capitalist prosperity. What is the prospect for that scenario repeating, as Trump and his supporters no doubt hope and expect? As indicated in my previous article, gold production has indeed been expanding from the low point of the Great Recession (2009) through at least the early part of this year (2016). As I suggested, however, much of this rise was due to the extraordinary jump in gold production in China that started (after a several-year decline) in 2001 and continued through to the present. In addition to the sharp fall in real prices that began in 2001, boosting the profitability of gold mining, at least part of the rise in China’s production likely represented a “catching up” after the extremely low gold production during the Mao years. Still, that production counted toward expanding the global supply of the money commodity and together with the recent “mini-recession,” could potentially be the basis of an upturn in the economy in coming months. But will gold production continue to rise as it did in the 1980s and 1990s, a prerequisite for another period similar to the “Great Moderation”? Most experts in the gold mining and refining industry think not and in fact have been predicting that gold production will peak this year, just as it did around the year 2000. These predictions are partly based on the fact that new gold discoveries peaked in 1995, and 20 years are typically required to fully exploit such discoveries. Any further rise in real prices that would result from a coming Trump-induced upturn would increase the likelihood of a near-term peak in gold production. It is of course theoretically possible that some major new discovery will be made in the near future, or that a way is found to mine gold on an asteroid. However, such developments are highly unlikely in the period ahead. The profitable mining of gold from asteroids is decades in the future if it ever occurs at all. The most realistic prospect is for gold production to start declining soon if it hasn’t already—until a serious new overproduction crisis lowers production costs to the point where an inflow of capital and rising gold production lay the basis for a new sustained rise in real prices and another extended period of relative capitalist prosperity. A scientific, Marxist analysis of current trends of production and overproduction strongly suggests that some combination of a re-run of the late 1990s and mid-2000s boom phases of the industrial cycle followed by a major crash is now on the agenda. High tech is once again likely to take center stage, with speculative investment in real estate also playing a role, especially in Silicon Valley—the U.S. center of the current dot-com frenzy—where housing costs are already soaring. The continuing rapid rise of industrial production in China, along with frenzied real-estate speculation there, will also be a major part of the mix leading to the next global overproduction crisis. Excluded is the promise of Donald Trump to bring back the 1950s-1960s glory days of the U.S. economy—“make America great again.” The objective laws governing the U.S. and global economies will not allow it. After a possible—most likely short—period of initial success, the next major crisis of overproduction will strike, and strike hard. Trump and his policies and promises—along with his proto-fascist allies—will be progressively discredited. In the meantime, it is essential that the movements negatively impacted by the reactionary policies Trump will try to force through—with rhetorical but little real opposition from the Democratic Party politicians—unite in active, independent opposition, in the electoral arena and more importantly in the streets. In the aftermath of the coming crisis, a mass working-class party can quickly arise with the perspective of achieving a workers’ government and beginning the construction of socialism—the ultimate solution. *A fuller explanation of the regulatory role of the law of labor value and the money commodity gold that takes into account the capitalist drive to maximize profit in industries with differing ratios of “living” to “dead” labor, transforming labor values into what Marx termed “prices of production,” is beyond the scope of this article but does not affect its basic conclusions. Revolution Manifesto Class 4: Revolution in the U.S.